Our friends at K-State continue great work in Sports Medicine. Congratulations Matt and Mindy! The world of college football is full of triumphs and disappointments. Career-ending injuries don’t have to be one of them. 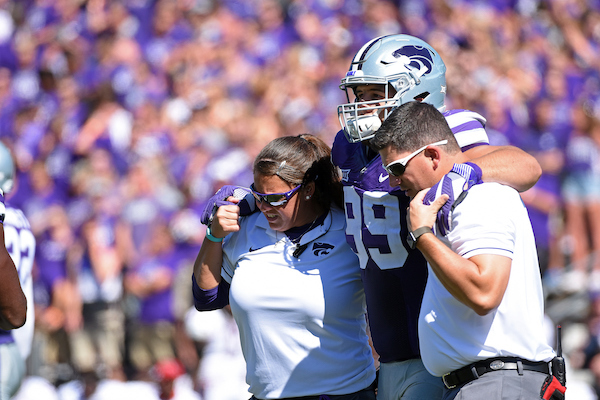 Two exceptional athletic trainers have been crucial members of K-State’s award-winning sports medicine department for the past 12 years. Matt Thomason and Mindy Hoffman are often the first on the field to assist and assess an injured football player. Together they have helped create a culture of successful continuity amongst K-State’s department of sports medicine. In 2017, K-State received the Big 12 Sports Medicine Staff of the Year award. Just last weekend, Hoffman was recognized as the Texas Tech Health Sciences Center Department of Rehabilitation Science Distinguished Alumni award winner. She can add the honor along with being named the 2016 Big 12 Assistant Athletic Trainer of the Year.